Are you looking for lesson plans that incorporate American Indians? With Thanksgiving approaching, teachers across the country are getting ready to teach children about Native Americans. Unfortunately, October (Columbus Day) and November (Thanksgiving) are often the only times of the year that Native peoples make an appearance in the curriculum. That is not educationally sound and its a long way from "best practice!" I urge teachers to teach about American Indians throughout the year. 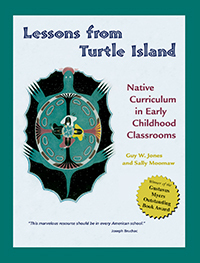 Here's one book to help you do that: Lessons from Turtle Island: Native Curriculum in Early Childhood Classrooms, by Guy W. Jones and Sally Moomaw. Throughout this book, we have often relied on outstanding children's literature, usually by Native authors, to introduce positive, accurate images of Native peoples to children. It is our view that, with the possible exception of classroom visits by American Indian people, excellent children's literature is the most effective way to counter deeply held stereotypes and help children focus on similarities among peoples as well as cultural differences. The literature serves as a catalyst to extend related activities into other areas of the curriculum. Omission of Native peoples from the curriculum, inaccurate curriculum, and stereotyping all amount to cultural insensitivity. This is heightened, however, when well-meaning teachers introduce projects that are culturally inappropriate. There's great suggestions, throughout. Chapter 2 includes a lesson plan called "Children and Shoes" that uses Bernelda Wheeler's Where Did You Get Your Moccasins? and Esther Sanderson's Two Pairs of Shoes. It includes suggested activities in dramatic play (Shoe Store), math (Shoe Graph) and science (Shoe Prints), all of which convey similarities across cultures. Chapter 6 is about the environment. Featured are two of Jan Bourdeau Waboose's books, SkySisters and Morning on the Lake. In the "not recommended" section that closes each chapter, the authors of Lessons from Turtle Island tell us it is not recommended to ask children to make up Indian stories, and explains why. As a former first grade teacher, I highly recommend this book to anyone working with young children. Thank you...looks like a good resource! I am currently teaching an Ojibwe culture class as part of the GT program I teach...I love teaching about native cultures and find it very important :) The kids also love it.